Job hunting requires some creative thinking. Whether you've been in the same job for many years or find yourself having to "transition" to a new job, making a career change can be a frightening and frustrating experience. The Department of Labor’s Office of Research recognizes the difficulties this kind of change can bring. 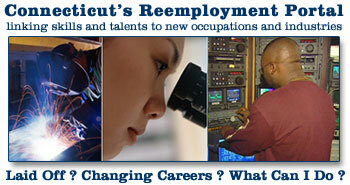 We developed Connecticut’s Reemployment Portal to inform and prepare you to take charge of your career. Connecticut’s Reemployment Portal displays occupations with similar characteristics such as knowledge areas, tools and technology, and general work activities of your selected occupation. Career development is a lifelong, ongoing process. We hope Connecticut’s Reemployment Portal connects you with helpful information as well as excellent opportunities. Enter a word, phrase, or title to search for an occupation. Over 900 career options. Find yours in one of these industries. Examples: 0963, radio operator, communications. Based on work performed, skills, education, training & credentials.